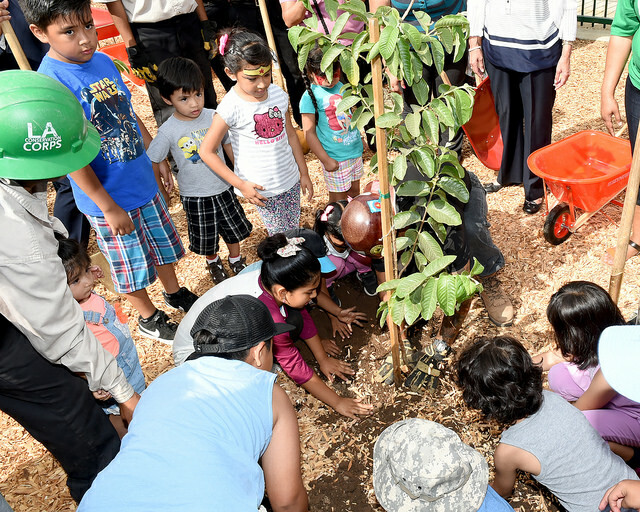 The seeds of a five-year investment to improve access to fresh produce by First 5 LA reached full bloom in late July with the grand opening of Belvedere Community Garden in East Los Angeles – the last of eight community gardens constructed throughout Los Angeles County. The opening was celebrated by L.A. County Board of Supervisor Chair Hilda Solis, the Los Angeles Conservation Corps, the Los Angeles Community Garden Council & the Neighborhood Land Trust, as well as community families and leaders and representatives from First 5 LA. In 2012, as part of the Healthy Food Access Initiative, First 5 LA awarded a five-year, $5 million grant to the Los Angeles Conservation Corps (LACC) to construct the eight gardens. With approximately 30 plots at each garden, the project currently provides a minimum of 6,000 pounds of fresh fruits and vegetables per year and serves over 100 families with children prenatal to age 5. The lead on this project, the Los Angeles Conservation Corps, created Little Green Fingers as a brand for the gardens and have leveraged an additional $110,000 for supplemental activities and enhancement of the program. The gardens provide open spaces for communities to develop the infrastructure to grow and consume fruits and vegetables in an effort to support obesity prevention, increase food security, provide physical activity and support community connectedness. To ensure families can fully benefit from having the Belvedere Community Garden at their fingertips, Little Green Fingers will feature ongoing activities that will include: gardening education, nutrition classes, and cooking classes at no cost. A unique feature of this project is that the community had key input in the designing and building of the garden. “Since day one, families and community members have had real ownership in this garden. Before ground was broken, they provided ideas and told us what would work best for their families. They worked with corps members down to mulching and spreading dirt. They were part of the entire process,” said LACC Marketing Director Kea Duggan. The partnership with LACC served an important dual purpose, providing their corps members the opportunity to learn new employable skills. “This project helped both little children and our young adults. The garden directly benefits the community residents and it’s also a fantastic opportunity for our corps members. One of our corps members is a gardener here. They saw that transformation from a barren lot to a safe space and healthy start for families,” Duggan explained. In other success-related news, First 5 LA joined its’ partners on June 30 to celebrate the grand opening of the Vermont Manzanita Apartments. This 40-unit building in Koreatown now houses 15 formerly homeless prenatal to 5 families who have had some experience with the child welfare system. The West Hollywood Community Housing Corporation led the development of the property and the Children's Institute, Inc. is the family supportive services provider. “It was a special treat to meet a few of the families who kindly opened their new homes for us visitors to tour,” said First 5 LA grants management officer Sharon Murphy. 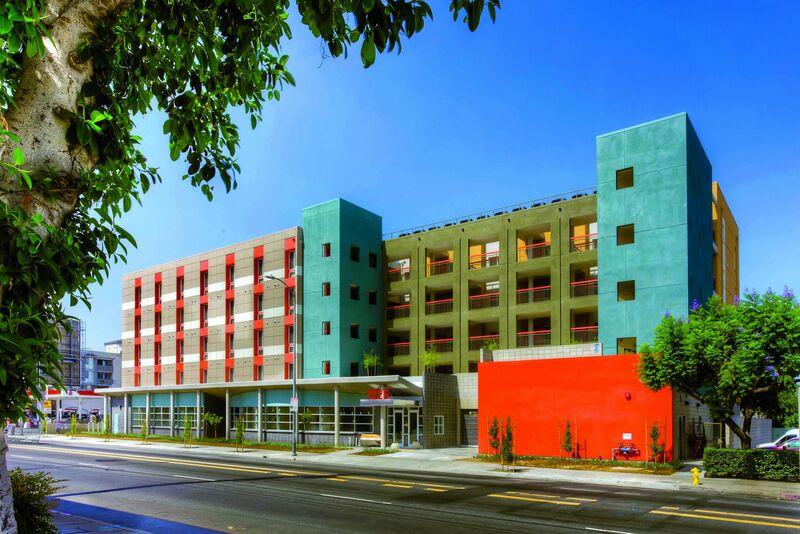 Vermont Manzanita is the third of five First 5 LA capital developments for homeless families as part of First 5 LA's Homeless Permanent Supportive Housing initiative. First 5 LA contributed $3.5 million to build the units and another $200,000 to fund supportive services for the residents.